If you’ve checked out my #home_withme hashtag on instagram, you may have notice I’ve moved into a new space. Slowly but surely, we’ve been decorating my space. I’ve been working with Talia, an interior designer from Home Polish to design my place. She totally gets my personal style and how it relates to my home. Feminine but not girly, neutral, touches of mixed metals and everything has a sense of ease and comfort. The first big project I wanted to share with you guys that we did was my gallery wall. This is on the wall next to my dining room table and by the kitchen. The walls are really tall here so we wanted to fill the space because it looked really bare. Talia is still working on adding a few additional pieces, but I was so excited I couldn’t wait to show you a sneak peek. The art is from a combination of places. A few items are from St Frank (this, this and this that is on my bookcase) and a lot of the pieces with had found online and sent to Framebridge to get framed. 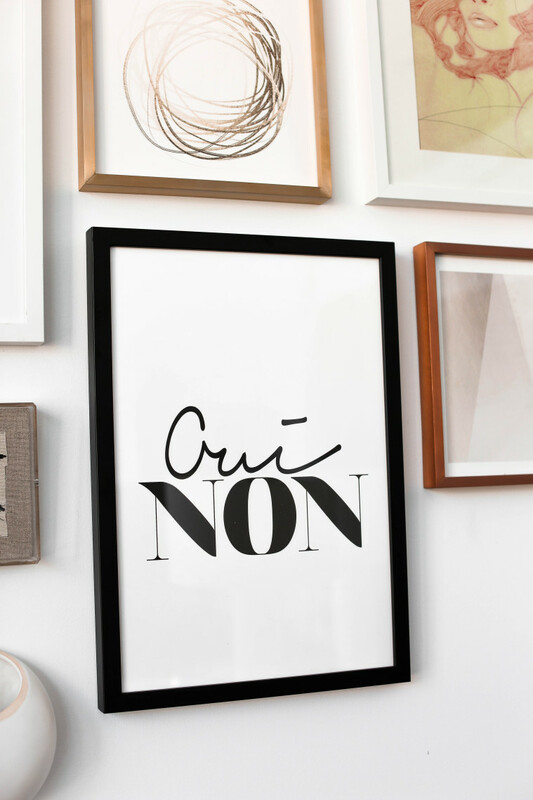 With their site you can either send them art or upload an image for them to custom frame. This was great because some art we purchased digitally through etsy and could directly send them the file. With the art we ordered, we sent them the pieces and Talia had so many frames to choose from. A favorite of mine is the Carson clean gold frame around the moto jacket and the Mercer modern black frame for the Oui Non piece. 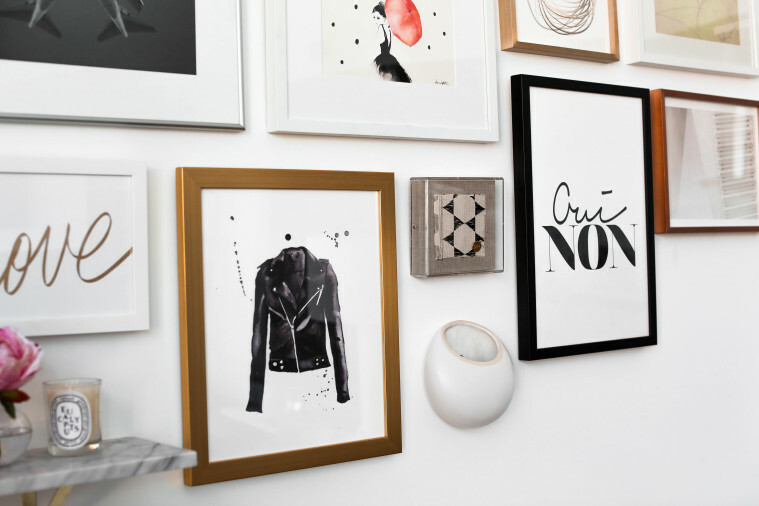 We wanted the gallery wall to have enough mix of black, white and metal frames along with different textures and 3-D objects. How do you like the wall so far? Can’t wait to show you more of my home! Use my code LIFEWITHME15 for 15% off your first Framebridge order! I absolutely love it when you post home decor and home desiGn. I love finding new ideas fOr my own home and your taste is so fab! More please! 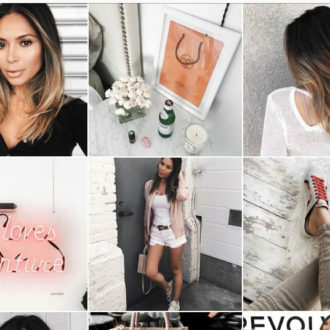 I find this wall extremely beautiful, as you mentioned, she has captured your style completely, feminine but not girly which is exactly what i love also. stunningly chic! I’ve just seen the pic on ig and came to check the blog. omg, i absolutely love it! the combination of items just looks so elegant, loving your art gallery! This is sooo cute! I love the shelving that you added. It gives it that extra touch that’s also practical for displaying things! WheRe is the marble shelf from? Marble shelf is life where ever is it from ? Wow this looks amazing. I need the marble shelf in my living room! 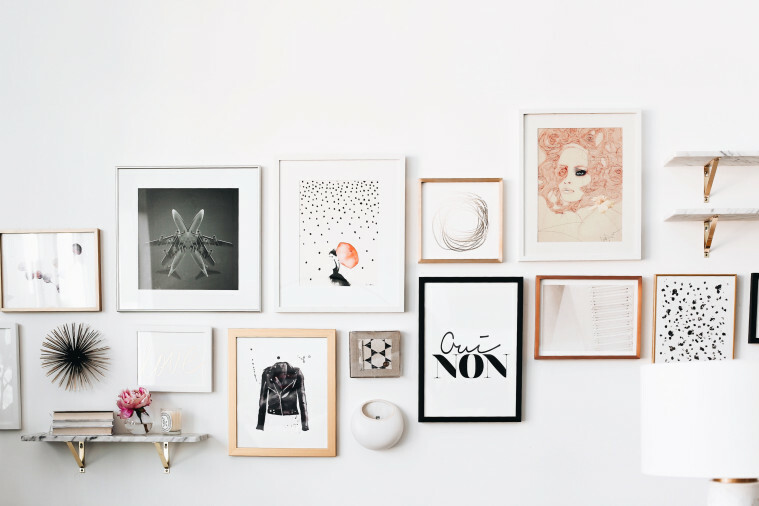 Nice gallery wall. I would love to work with an interior designer on my future home. My boyfriend, of course, thinks it’s a waste of money haha. Your home looks amazing! 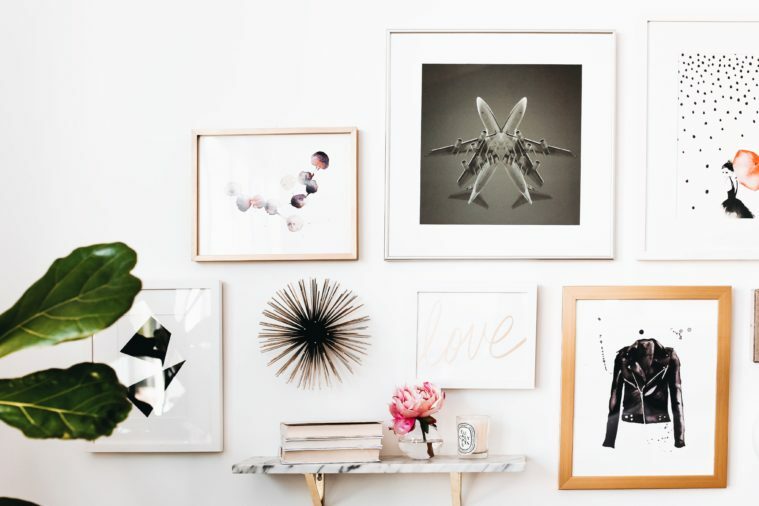 Please share more interior design inspo on your blog-I have really been interested in that alot more particularly. OMG I LOVE THIS SOOOO MUCH!!! THIS IS EXACTLY HOW I WANT MY FUTURE LIVING ROOM TO LOOK! UGH LOOOOVE! Hi Marianna! 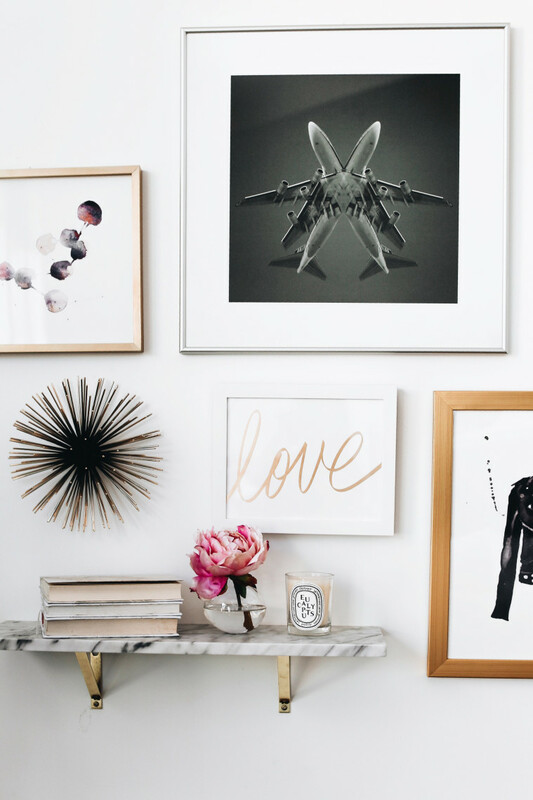 love your home decor, especially this art gallery! just wanted to know the name of or where i can find your potted plant from? thank you! marianna! i have been dying to know, where is that photo of the blush woman from?